The Death of an Heir is Philip Jett's chilling true account of the Coors family’s gilded American dream that turned into a nightmare when a meticulously plotted kidnapping went horribly wrong. In the 1950s and 60s, the Coors dynasty reigned over Golden, Colorado, seemingly invincible. When rumblings about labor unions threatened to destabilize the family's brewery, Adolph Coors, Jr., the septuagenarian president of the company, drew a hard line, refusing to budge. They had worked hard for what they had, and no one had a right to take it from them. What they'd soon realize was that they had more to lose than they could have imagined. On the morning of Tuesday, February 9, 1960, Adolph “Ad” Coors III, the 44-year-old CEO of the multimillion dollar Colorado beer empire, stepped into his car and headed for the brewery twelve miles away. At a bridge he stopped to help a man in a yellow Mercury sedan. On the back seat lay handcuffs and leg irons. The glove box held a ransom note ready to be mailed. His coat pocket shielded a loaded pistol. What happened next set off the largest U.S. manhunt since the Lindbergh kidnapping. State and local authorities, along with the FBI personally spearheaded by its director J. Edgar Hoover, burst into action attempting to locate Ad and his kidnapper. The dragnet spanned a continent. All the while, Ad’s grief-stricken wife and children waited, tormented by the unrelenting silence. The Death of an Heir reveals the true story behind the tragic murder of Colorado’s favorite son. PHILIP JETT is a former corporate attorney, now living in Nashville, Tennessee, who has represented corporations, hospitals, CEOs, celebrities from the music, television, and sports industries, and other noteworthy clients. Since 2007, he has ghost-written for business clients, contributed articles to a Nashville newspaper, and focused on writing narrative nonfiction for publication. He has two sons and volunteers often for children’s causes. 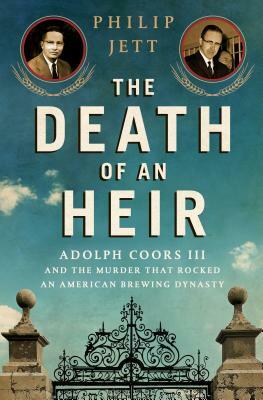 Philip is the author of The Death of an Heir: Adolph Coors III and the Murder That Rocked an American Brewing Dynasty.